Creowave will be attending the 1st ISA UAE Automation conference and Exhibition. The conference will be held on 30th to 31st of March in the St. Regis Saadiyat Island, Abu Dhabi -UAE. Adipec, the world´s largest exhibition for oil and gas takes place in Abu Dhabi between 9th and 12th November. Creowave is present in the event to promote the C-site Remote Monitoring System on stand 14070. – C-site u nits have already been delivered to customers for pilot projects. The feedback for the system is very positive, there is clear need for a system that provides accurate real-time data wirelessly to the end user to a location where it is needed, comments Teemu Vähäkangas, the Vice President of the company. The C-site Remote Monitoring System has been designed to provide a modern way to remotely monitor the wells on the oil and gas fields. The units are certified to ATEX and IECEx Zone 1 requirements. In addition, FCC and IC approvals have been granted. Creowave welcomes everyone to meet us at the stand 14070 in Adipec. Follow us on Twitter @CreowaveADIPEC. Creowave was established in December 2014 and celebrated its 10th year last month. The whole company gathered together to celebrate the successful journey. Creowave employees and visitors can now also enjoy a fresh new look at Creowave offices. Creowave has been renewing its offices, lounges and meeting rooms, today we warmly welcome our clients and partners to visit us at the renewed premises! Every year we choose to support one charity organization instead of sending Christmas cards or presents. This year we have chosen to support Save the Children organization. More about the organization and all the good deeds is found here. We wish to thank our partners, customers and suppliers for the good co-operation in 2014 and wish everyone a peaceful and happy holiday season! Let the New Year to be filled with joy. Creowave is proud to announce the new ESS test facilities in the company premises. “Over the years we have tested our products with third party lab outside our own facilities. 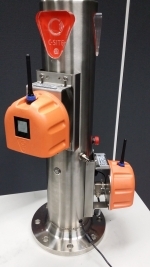 The cooperation has worked well but as the quantities have increased steadily and many of the Major Oil companies are more focused on repeated qualifications for vibration, shock and temperature cycling according to the ISO 13628 standard, the need for our own lab became necessity, “explains Jyrki Koski, Creowave CEO. “Our own test facility helps of course logistically and reduces the delivery times to our customers. This is very important step for us on maintaining and increasing the reliability of our products for the benefit of our customers in international Oil & Gas community. ”, he adds. Creowave ESS test laboratory is now in action at the company facilities in Oulu, Finland. The premises will generally be used for qualification and product ESS testings according to ISO-13628-6 subsea standard, but will also contribute on the verification testing for the reliability and lifetime Stress Screening tests done for all products going to be used in Oil fields. First customers have been present on witnessing tests and to see the new facilities and standard production flow for both Subsea and topside units is now going through the testing in-house. DNV visited Creowave on 19th September for an annual ISO9001 quality system audit. “The audit went very well as the company is committed to continuous development and improvement of the quality management system. This year we expanded our quality management system to cover also the quality management of ATEX products with ATEX/IECEx certification” comments Katja Lehtomaa, the Quality Manager of the company. “The ATEX/IECEx extension to our quality management system is something we have been preparing for the whole year so I am very pleased that we have now the official certificate on the wall”, she adds. ONS 2014 exceeded all the expectations this year– with a record breaking number of 91 682 visitors, 1 380 exhibitors and a conference with 700 delegates participating every day. Creowave attended the event for the third time, in the Finnish Stand at hall D.
More news will be available at the official ONS websites. Creowave will again attend one of the world´s most important meeting places for everyone involved in the oil, gas and energy businesses. This year ONS is held between 25th and 28th August in Stavanger, Norway. ONS 2014 main theme is “Changes”. ONS Exhibition consists of 1250 exhibitors in 33 000 square meter exhibition area. 60 000 visitors are expected to the event! Creowave will attend the event as a part of the Finnish Stand at Hall D, stand 458. For more information about the ONS 2014, please click here. MPM User Group Forum was held in mid-June at Stavanger, Norway. Creowave CEO, Mr Jyrki Koski, was being invited to the annual Forum organized and gathered together by Multi Phase Meters AS. Mr. Koski held his speech regarding High reliability & MTBF Electronics. “As the numbers of electronics installations are increasing in the Oil & Gas industry, the reliability of the electronics is becoming more important than ever before. For us, as representing a company providing electronics for subsea industry, it is very important, that all the parties have realised the importance of quality and reliability. Costs of replacing equipment is so huge, that there is no room for mistakes”, says Jyrki. “As a market leader in reliable electronics in Subsea, we want to contribute on developing future fields and enable the oil companies to start to use the potential of the electronics in Subsea”, he continues. The Forum was held at the Norwegian Oil Museum at Stavanger. Last week Creowave visited Multi Phase Meters AS in Stavanger, Norway. Creowave kept its project team building event in Stavanger by exploring the oil- and gas history and requirements. Creowave has a strategic partnership with the MPM AS while MPM has integrated Creowave metering product to be a part of its own complete solution. By visiting MPM all the Creowave employees got the full picture of the solution, its usage and advancement. After visiting MPM, Creowave also got the chance to visit the the Norwegian Petroleum Museum in Stavanger. More information of the museum is found here.